What does the Beaconstac starter kit include? The Beaconstac starter kit comes with 3 enterprise-grade beacons, the Beaconstac app with SDKs for iOS and Android, and access to our cloud-based proximity marketing and analytics console for a year. Purchasing the starter kit will give you access to our engineers who will assist you with setting up your first location-based campaign. Do I need to be able to code to use your starter kit? No, not at all! 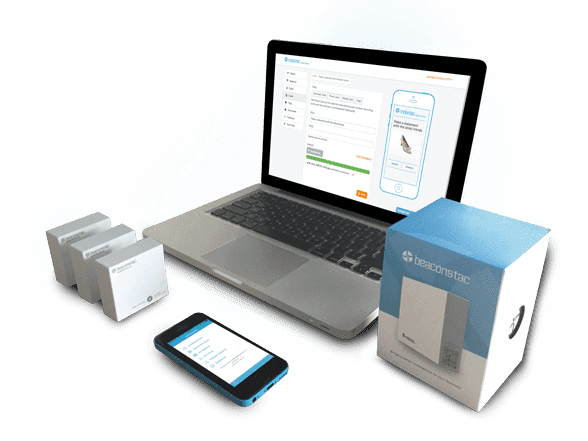 With our Beaconstac app, intuitive cloud-based console, and knowledgable support team, anyone can easily implement a beacon demo with the Beaconstac starter kit in minutes—without a developer’s help. Beaconstac offers an end-to-end solution, and thus our platform and SDK can only be used with our beacon hardware. How long do your beacons last? Each beacon, powered by AA batteries, will last up to 4 years at default settings, making this a highly reliable and long-lasting solution. We will replace any defective beacon within 15 days from the date of delivery at no charge. You must contact us at support@beaconstac.com to report the problem and allow for troubleshooting, if necessary. How can I monitor the health of my beacons? Once beacons are set up, you can monitor parameters such as battery level, temperature, and signal strength through the Beaconstac app. You can then log into the admin console to see these health metrics for all of your beacons under a feature known as Fleet Management. How can I manage beacons across multiple locations? A great way to manage beacons across multiple locations and to assign rules to groups of beacons in separate physical spaces is to use a Beaconstac feature known as 'Tags'. For more information on how to use tags, check out this post on the developer blog. What sort of campaigns can I create using the Beaconstac starter kit? The Beaconstac starter kit can be used to demo campaigns across a variety of use cases, from retail to events to museums and more. We have curated several campaign ideas on our blog with clear setup instructions to give you some ideas! Learn how you can use beacons to collect session feedback. Learn how you can turn your mannequins into smart mannequins. Learn how you can set up an iBeacon campaign to increase sales.